It's Thursday again, and you know what that means. 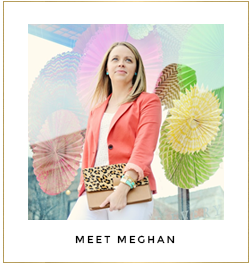 It's time to get linked up and go meet some new blog buddies! But first, we want to thank those of you who linked up with us last week. We loved seeing everyone's posts and are looking forward to seeing what you have in store for us this week! We love how Meg of Everyday Meg paired citron with cobalt for a bright, classic look! And who doesn't love a pop of leopard? It's no secret that we love stripes, so naturally we're swooning over this fabulous skirt worn by Julie of Obsessed. And how adorable is it paired with chambray and her beaded rose necklace? Ainslee of A Beautiful Heart looks darling in black and pink, which is always such a fun combo! And that bag is perfection. Link up for your chance to be one of the featured three next week! Three-fer Thursday is a linkup party where you submit your favorite post from the week and link it up here at Perfectly Coutured and Everyday Fashion and Finance. The following Thursday, we will choose three of those posts that we particularly enjoyed and then share them with all of you! If you're one of the chosen three, we will email you on Wednesday evening to let you know so you can post about it on your blog (if you want)!